Hinduism is partly revelatory and mostly evolutionary, while Christianity is mostly revelatory and partly evolutionary. Hinduism is a continuously evolving religion, not founded by a particular person or prophet and shaped by the collective wisdom of enlightened masters, incarnations and revelations of God accumulated over several millenniums. It is regarded as an eternal religion (sanatana dharma) by its followers. Christianity is founded by Jesus Christ. To be a Christian, one should invariably believe in the way of Jesus only and acknowledge him as the only savior. Central to Christianity are the life and teachings of Jesus Christ and the glory of God, as described by witnesses and others in the old and new testaments of the Bible. The Bible is the main source of the principles and values of Christianity. The Roman Catholic Church acknowledges tradition along with Bible as the source for their doctrine. Central to Hinduism are the smritis, or books of revelations, which include the Vedas, the Agamas and the Bhagavadgita, which Hindus revere as God in word form and which are considered to be eternal, inviolable and revealed by God for the welfare of the worlds. Tradition, law books, the epics and the Puranas and the writings of several enlightened scholars, philosophers and masters also play an important role in the religious lives of Hindus. Hinduism played a significant role in the emergence of other world class religions such as Jainism, Buddhism and Sikhism and shaping the history of the eastern world, while Christianity played a significant role in shaping the history of Judaism and Islam and the western world. Hinduism is also the most dominant source of inspiration for many new age religions and religious movements. Christianity is an organized missionary religion. Its activities are guided and regulated by its churches. The churches are independent organizations having a tradition and history of their own. According to a widely accepted school of thought, the Christian Church is divided into three major groups, the Roman Catholic Church, the Protestant Churches and the Orthodox Churches. The apostles established several independent churches in different parts of the world of which the Roman Church of the Vatican became the most successful. Hinduism does not have a centrally controlling organization like the church of Rome headed by the Pope or the Protestant Church of England headed by the ruler of England. It is a decentralized religion with no particular authority except the authority of some ancient scriptures to guide it. For a long time, the priestly class has kept the ritual tradition of Hinduism alive and still play a dominant role in the temple traditions. The temples do bring people together and create a sense of belongingness. But they have no control over the religious lives of Hindus. The Shankaracharya began the tradition of religious matts in different parts of the country, each headed by a religious leader. But they do not have the kind of authority or influence as some of the established churches of Europe. However in both Christianity and Hinduism there is a divergence of opinion and tradition. If Christianity is a loosely held religion of several organizations, churches, movements and traditions that believe in Jesus and owe their allegiance to him, Hinduism is a set of several loosely held religions, sects, sub-sects, schools of thought and teacher traditions that believe in the Vedas and accept certain core beliefs as inviolable authority. Hinduism and Christianity differ widely with regard to their individual approach towards other religions. Certain orthodox sections of Hindus may not like to dine with Christians or allow inter religious marriages or have social engagements outside their particular castes, but from dogmatic point of view Hinduism tolerates Christianity and other religions. According to Hinduism the paths to God are many and in whatever way we worship Him sincerely He responds. Christianity has an uncompromising attitude towards other religions in matters such as the infallibility of the Bible and belief in Jesus Christ. Any form of worship not approved by the Bible is an anathema to the Christian faith. According to Christians the only way to salvation is the way of Jesus and faith in Jesus and only those who believe in him would be saved from the consequences of sin against God. It is blaspheme to question the actions of God or the teachings of Jesus or belief in Jesus himself. Technically both Islam and Christianity are intolerant religions in which there is little scope for any compromise or reconciliation. To accept another religion one has to permanently disown one's own religion and the teachings of its prophets. Hence so much of irreconcilable differences and religious animosity. Christianity believes that God created the worlds out of nothing. Hinduism declares that nothing can come out of nothing and that everything has to exist in a latent form before it manifests. So God created the worlds out of himself using the elements and qualities of His energy known as Prakriti. Christianity believes that God and men are different. God created man in His own image but the world and men exist separately from Him. So is the kingdom of God. Hinduism believes that God created men and beings out of Himself and resides in them as individual atman or self. Essentially beings, objects and God are the same in their inmost aspect as Self. God lives everywhere. The whole universe is enveloped and inhabited by Him. His highest world is a world of uniform bliss and unconditional love in which there is no illusion, no limitation and no duality. Hinduism believes that the universe was created billions of years ago through a gradual process of materialization brought out by Prakriti and that the earth is just one world in a series of thousands of worlds. Christianity believes that the world was created a few thousand years ago over a period of seven days and that earth is the center of the universe. Hinduism does not believe in the conversion of people. A person becomes a Hindu either by birth or through conscious choice. In the Bhagavadgita Lord Krishna advises men not to follow another's dharma however superior it may be for it would hamper their spiritual progress. Christianity does not think so. Christianity accepts conversion as a way of bringing non believers into the fold of believers and saving them from a certain damnation. It is the responsibility and sacred duty of every Christian to save their fellow human beings who are not Christians by bringing them to the path of Jesus and fulfill his promise to the mankind. According to Hinduism man is judged by his own karma and the consequences of his desire ridden actions decide his fate and future continuously. As long he indulges in egoistic and desire ridden actions, induced by the qualities of nature, considering himself to be the doer of his actions, he runs the risk of leading an illusory and ignorant life subject to the cycle of births and deaths and the laws of nature. The only way out of this is by doing desireless actions, surrendering to God and acknowledging Him as the doer of all actions, offering the fruit of all actions to Him with detachment, devotion and sense of sacrifice. Christianity believes a person commits sin against God by transgressing His law, not against himself. If he leads a life of sin without acknowledging God and without believing in Jesus, he will become a victim of the Devil and fall into temptation. The gates of hell will be wide open for him. If he is a true believer, God will save him and grant him an eternal life in heaven. So it is the conduct of a person upon earth in the light of God's established law and his belief in God that determines the fate of an individual here and hereafter. A sinner can seek forgiveness of God and Jesus through repentance and submission and he will be forgiven according to the strength of his belief. On the Judgment Day all souls are resurrected and judged by God according to their actions on earth. Both Hinduism and Christianity believe in the eventual destruction of the world. However Hinduism does not believe in the permanent destruction of the world but in the repetitive nature of creation. There will be repetitive cycles of creation followed by destruction. God does it for his own enjoyment. Each cosmic cycle is equivalent to a day of God which stretches over billions of years and comprises of four cosmic ages or yugas. God is creator, sustainer and also destroyer. He creates the worlds through a centrifugal process of expansion or going out like the rays of the sun or the web of a spider while he destroys them through the centripetal process of withdrawal or contraction. At the end of each cosmic cycle God withdraws His entire creation into Himself and then goes into sleep or hibernation to be awakened again after a certain time to initiate another cycle of creation. Christianity does not believe in the repetitive cycles of creation. Creation takes place in an instant through the will of God over a period of seven days. There is no evolution of life. All life happens at once. The beings live upon earth only once never to return to it again. After that they reside either in the heaven or in the hell eternally. At the end of creation, following a fierce battle between the forces of good and evil, God heralds a Judgment Day on which he decides the fate of each individual according to his or her actions upon earth. In Hinduism there is no concept of a prophet or messenger of God. There are no hard and fast rules as to how God reveals His knowledge and chooses His messengers. Sometimes He incarnates Himself, sometimes He reveals Himself physically to pure beings and some times He selects a heavenly being or a pure soul on earth to do the work for Him. He reveals his knowledge through the Vedas at the beginning of each cycle of creation. Besides, every self-realized person who has overcome the duality and is one with Brahman is a messenger of God in his self-realized state. According to Hindu scriptures, the battle between good and evil forces is ongoing and continuous and whenever the evils seems to be gaining ground, God heeds to the call of His devotees and takes the side of the good to restore the balance. In His aspect as Lord Vishnu, He incarnates upon earth in human form several times to restore order and destroy the evil. His next incarnation is going to be that of Kalki which will come at the end of this cosmic age. According to Christianity God has sent several prophets in the past starting with Abraham to preach His message. Then in an epochal event of cosmic proportions he decided to send His only son, Jesus Christ in flesh and blood to remind the people of His law and give them an opportunity to redeem themselves eternally. Christians believe that although born in a human form, Jesus should not be mistaken as a mere human. He is the son of God who came to the earth willingly with a specific mission to save the humanity by showing them the true way. They also believe that there would be no more messiahs till the second coming of Christ during which he will judge the living and the dead. Christians believe in God, the Trinity, Jesus and Holy Spirit. Hindus believe in absolute highest Brahman, Mother Goddess, the Trinity of Brahma, Vishnu and Siva and several hundreds of gods and goddesses, emanations, incarnations, aspects and so on, essentially as different aspects of one supreme Brahman. In Christianity God and the Trinity are different. In Hinduism God and Trinity are one and the same in their purest form. The Trinity is but His functional and awakened aspect. Hindus also worship Mother Goddess as the universal mother. According to some, she is an aspect of God and according to some independent of Him. Besides God, the Holy Ghost and Christ, some Christians venerate Mother Mary, acknowledge her miracles and accept her as Holy Mother, pure and sinless, who ascended to the heaven in her physical form through the intervention of Jesus Christ. Some churches approve offering of prayers to saints and belief in the communion of Saints and Apostolic succession. Missionary activity is an integral aspect of Christianity and rooted in the teachings of Jesus. A mission is considered as the will of God whose aim is to enhance the glory of God as reflected in the teachings of Jesus by planting new churches all over the world and increase the number of God's disciples. In Christianity a church is not a mere building but an organization of true believers. Officially Jesus is the head of all the churches in whom are vested all the powers of governing them. The churches play an important role in spreading the teachings of Jesus among non believers and recruiting new converts. In Hinduism a temple is essentially a place of worship where devotees can congregate and offer their worship. The priests and temple administration do not indulge in missionary activity. They do however provide, wherever possible, facilities for people to listen to discourses or participate in religious events. In Hinduism marriage is between two souls whose relationship may go beyond this life and stretch over several past and future lives. In Christianity the purpose of marriage is procreation, companionship and cohabitation. In Christian tradition polygamy and divorce are not allowed. It is God's will that marriages should be strictly between one man and one woman. At one time, Hindu tradition permitted both polygamy and polyandry, but both are now declared illegal. Marriage in Hinduism is a sacred relationship between only a man and a woman, whose primary purpose is procreation and achievement of the four aims of human life, dharma (personal, family, social and religious laws), artha (wealth), kama (sensual enjoyment) and moksha (spiritual liberation). Christianity believes that men and women are created separately and differently. Hinduism believes that the gender of a being is a personal choice or product of one's past karma. A soul does not have to be eternally male or female. It may take birth either as a male or female depending upon its past actions. In contrast Christianity believes that a soul is either male or female and remains so eternally. Christianity believes that God created laws for the benefit of mankind and whenever any one transgresses these laws he commits sin against God. Since it is almost impossible for people to obey the law of God, they invariably commit sin. Jesus has promised to take upon himself the sins of all those who believe in him and accept him as their savior and there by save them from possible retribution. Those who do not believe in him will go to hell as they have no redemption for their sins. Hinduism believes that sin is committed by beings against themselves, not against God. God creates beings out of Himself and then subjects them to illusion and ignorance. He is the cause of their ignorance. In Him there is no duality. He is neither wrathful nor vengeful but unbound bliss and love. So He would not sit like an old man in some grand heaven and punish people for their actions. He reveals His laws and lets the individuals to work out their salvation through their own efforts. Because He is unbound love, He always responds to the calls of His devotees, bestows upon them His grace and helps them achieve liberation either directly or through enlightened masters and saints. Unlike Christians, they can liberate themselves from this cycle of births and deaths by following any of the several paths revealed by Him from time to time. Hindus believe in karma and suffering and redemption through desireless actions and surrender to God. Christians believe in sin and redemption through refuge in Christ. Christianity believes in one heaven ruled by God and one hell inhabited by a devil, who is also described to be its chief prisoner. Hinduism believes in a gigantic star studded universe consisting of innumerable worlds, heavens and hells, created by one Supreme God and left to the care and control of several gods and goddesses. The dark world is populated by demonic forces who play a negative role according to the divine plan. Hinduism believes in the physical, mental as well as spiritual evolution of life. This is not exactly evolution as explained in science books but rather the progression of soul in matter. Christianity does not believe in any form of evolution. According to Christianity, God created all life forms at once over a period of seven days. In Hinduism manifestation is essentially a process of entanglement of pure soul with matter. Creation happens because the self becomes involved with the qualities (gunas) and principles (tattvas) of Prakriti and loses its true awareness. This is called illusion or maya or forgetfulness. Once the involvement reaches a particular level, a being decides to withdraw gradually from the sense objects and become completely free. This is called liberation or moksha. Left to itself this process may take a very long time. But human beings can hasten their liberation through the practice of devotion, desireless actions, yoga and meditation. During its existence upon earth, the soul passes through various physical bodies from lower organism to higher organisms and finally into human forms. In Christianity the concept of physical or spiritual evolution is anathema or sacrilege. God created the world perfectly from the beginning. He populated it with living forms. He created a man and a woman in the garden of Eden and asked them to abide by His law. He cast them away from heaven when they failed to obey. Hinduism believes that God inhabits the diverse aspects of His creation as inmost self. The soul exists in all animate and inanimate objects including stones, rivers, hills, plants and animals. Christians believe that only human beings have souls. Hinduism advocates belief in prayers, surrender, egolessness, forgiveness, compassion, unconditional love, harmlessness and inner purity. Virtue, faith and inner purity are vital to earn the grace of God. So does Christianity. In Hinduism these are the means to soul's liberation. In Christianity these are the means to abide by the law of God and personify the will of Jesus and Christian values. Liberation from sin comes not because of them but because of their abiding faith in Jesus and his teachings and the law of God. Hinduism is the most ancient living religion of the world with a history of over 6000 years. It played a significant role in the evolution of religious thought, astronomy, mathematics, metallurgy and medicine in the eastern hemisphere. Hinduism began as a vedic religion but over a period of several centuries it assimilated many other religious thoughts and movements such as Saivism, Vaishnavism and Shaktism. Divergent schools of thought arose as to the nature of God, nature of soul, the purpose of creation, the role of Prarkriti and the nature of earthly existence. Debate among scholars on some of these issues still continue. Christianity began its journey as an established religion after the migration of Christ's disciples to Rome sometime in the first century AD. They suffered initially from severe persecution by Romans till the Roman rulers saw light in the preaching of Jesus Christ and embraced Christianity whole heartedly. For nearly five hundred years after the gentiles and Romans were first converted to Christianity, the scholars quibbled among themselves on some important aspects of Christian theology such as application of the laws of the Torah, the birth of Jesus, whether he was man or God or son of God, the nature and status of Mary and the role of the church and the state and so on. The debate on some of these aspects still continues. Just as Buddhism posed a great challenge to Hinduism in the ancient period, Islam posed a great threat to Christianity during the medieval period. Despite the setbacks, Christianity triumphed against Islam in Europe and played a significant role in the evolution of religious thought in Europe, Africa, Australia and the north and south Americas. Christianity does not approve idol worship. Neither Hinduism. Hindus are not expected to worship lifeless idols or images. If some one does so, it is purely out of ignorance. Hindus are expected to worship living idols in which gods are installed through invocations and supplications. The idols are God in image form just as human beings are God in human form. They are worshipped only after they are infused with the presence of God and transformed into a living image. In Christianity baptism is a prerequisite to become a Christian. According to Hinduism a person becomes a Hindu by birth because he or she desired so in his or her previous life. However there is a provision to admit non Hindus into Hinduism through purification ceremonies. Some even suggest that a person can become a Hindu purely by choice or according to the wishes of an enlightened guru without any ceremony. In Christianity a born again Christian is the one who is originally a non-Christian and who has been baptized into Christianity by a church official. In Hinduism a twice born Hindu is usually an upper caste Hindu who has been initiated into vedic studies. Also spiritually every self-realized person is twice born. His first birth takes place when he is born physically and his second birth when he gains the knowledge of Brahman and Atman and the nature and purpose of his existence. According to one very popular theory, Jesus Christ said to have visited India when he was young and went to the Himalayas after visiting the Gangetic valley. He said to have received spiritual initiation in the Himalayas from some siddhas (spiritual adepts) before he returned to Jerusalem at the age of 34 or 32 and made his presence felt through his miraculous healing powers and powerful speeches. It is further said that he did not die on the cross, but escaped from Jerusalem with the help of his followers and traveled back to India and lived in Kashmir where his grave said to exist till today. According to the Unknown Life of Jesus Christ by Nicolas Notovich (1890), Jesus was initiated into Buddhism and lived in a Buddhist monastery as a monk for sometime somewhere in the Himalayas or Tibet before he returned to Jerusalem. He also visited Varanasi where he witnessed religious animosity between Buddhist monks and Hindu Brahmins. According to the Urantia Book, Jesus roamed throughout the Roman empire accompanied by two Indian companions and learned about India and Hinduism from them. According to the Aquarian Gospel also. Jesus visited India before he began preaching his teachings to the people of Jerusalem. While many instances are quoted in support of this theory, the following points need to be addressed with convincing proof. 1. Jesus Christ himself never mentioned anything even remotely about India or Hinduism. None of his disciples ever mentioned any thing about it in the Bible. 2. There is practically very little in common between his teachings and the main tenets of Hinduism or Buddhism except in matters of ethics and moral conduct. 3. It is hard believe that Jesus Christ lived in Kashmir, and being a great personality as he is, would have remained silent. He would have definitely made his presence felt in the region through his teachings. Besides it is hard to accept that he would have gone to Kashmir all alone without any of his trusted followers accompanying him. It is also a well known fact that after the death of Jesus the Christ and long before Europe was Christianized, one of the Apostles of Jesus, St. Thomas, went to India probably by sailing across the Arabian Sea and landed in what is now known as Kerala. He lived there for sometime and converted some people to Christianity, whose descendants practice a very ancient form of Christianity till date. St Thomas was however killed by the natives who were disturbed by his activities and unfamiliar doctrine. Christianity and Hinduism confronted each other in a big way during the British Rule in India. The activities of the Christian missionaries and the politics of East India Company led to the Mutiny of 1857, after which the British Government adopted a policy of secularism and kept itself aloof from the politics of religion and conversions. The Christian missionaries did a substantial work in the Indian subcontinent in helping the poor and the downtrodden, more for the purpose of conversion rather than philanthropy, except persons like Mother Theresa, but they could not achieve much in terms of conversions. Tensions do smolder between the religious communities from time to time, but it is more because of the critical and over zealous nature of prejudiced missionaries and the very uncompromising and inherent attitude of Christianity towards Hinduism and other religions. From the Christian perspective Hinduism is a religion of the heathens in which there is no place for Jesus and the law of Christian God and hence no scope for its followers to save themselves from eternal damnation. 1. 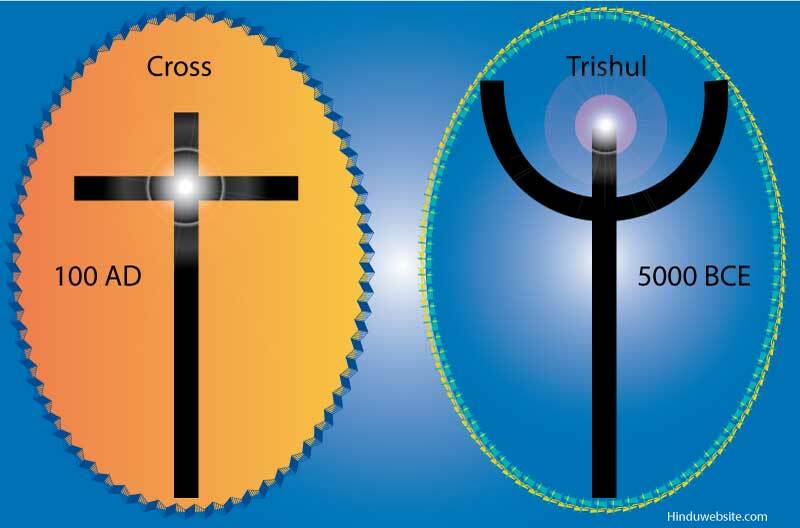 Please refer the descriptions in the Chapter The Cross and the Crucifixion in The Secret Teachings of All Ages by Manly P.Hall, Penguin Group (USA) Inc, Reader's Edition, 2003.